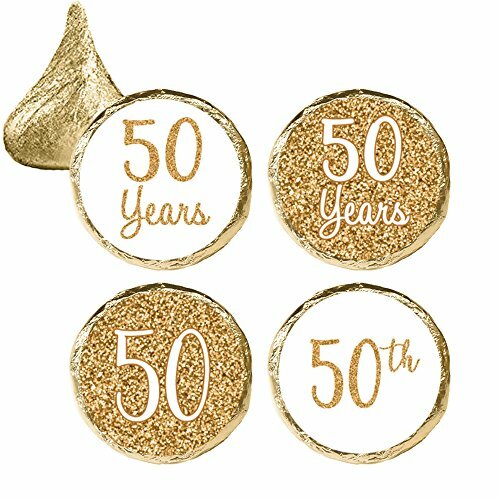 Order includes 54 Count - white and gold 50th anniversary party favor stickers. Use these pre-cut, self-adhesive candy wrappers on Hershey's® Miniatures Candy Bars. These stickers are made only for Hershey's® Miniatures candy bars; will NOT fit Hershey's® Nuggets. Order includes 2 designs pictured - 27 stickers of each design. 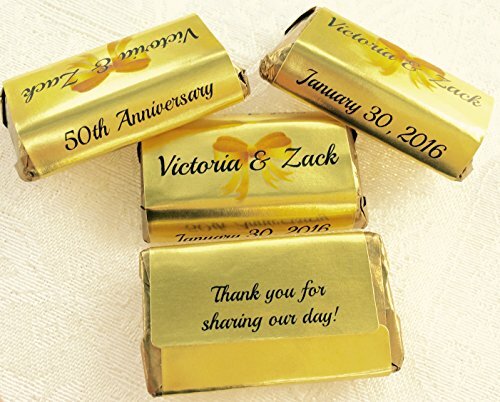 These decorative stickers are easy to peel and stick around mini candy bars for fast and glitzy gold 50 year wedding or company anniversary favors. Candy and other accessories not included. Always faux glitter - for the glittery look without the mess of actual glitter. Distinctivs® products are proudly Made in the USA. 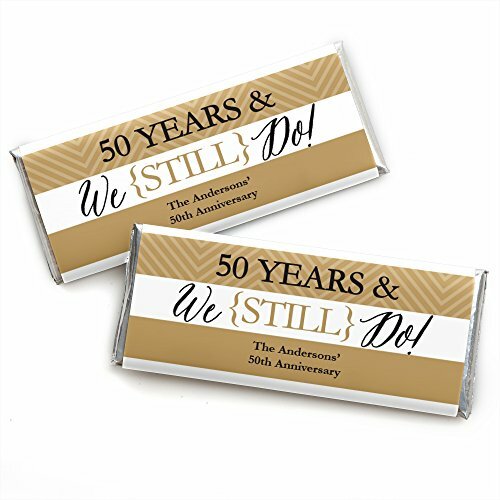 Our Custom We Still Do - 50th Wedding anniversary party candy bar wrappers are an excellent choice for a great personalized anniversary party favor - who doesn't love chocolate?! These wrappers are sold in sets of 24 and printed on premium-grade paper with a photo-like shine that's made in the USA. Each one comes with a special message on the front and cute "nutrition facts" on the back. Your guest won't be able to stop themselves from smiling! They are designed specifically for Hershey's® 1.55-ounce candy bars, and include the foil wrapper too. Our candy bar wrappers are easy to make, impressive to give and delicious to eat! 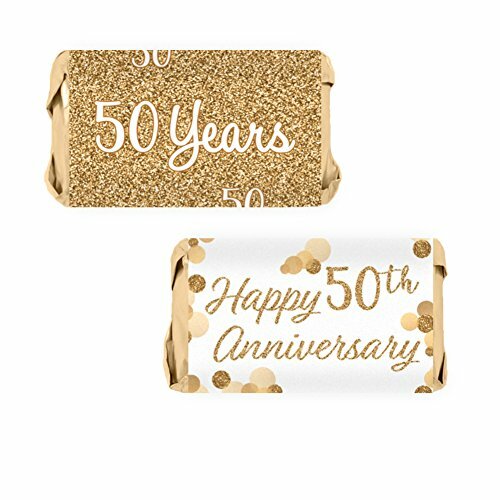 Order includes 324 count - white and gold 50th anniversary party favor stickers. Use these self-adhesive labels on Hershey's® Kisses candy or party invitation envelopes as seals. Order includes all 4 designs pictured. 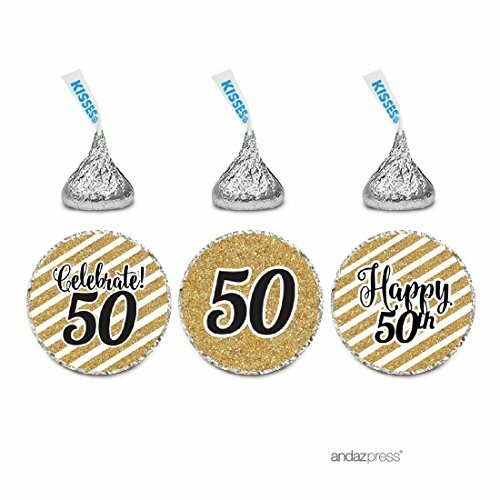 These decorative stickers are easy to peel and stick to most small candy wrappers for fast and charming 50th wedding or company anniversary party favors. Candy and other accessories not included. Always faux glitter - for the glittery look without the mess of actual glitter. Distinctivs® products are proudly Made in the USA. Our Custom We Still Do 40th Wedding Anniversary party candy bar wrappers are an excellent choice for a great personalized anniversary party favor - who doesn't love chocolate?! These wrappers are sold in sets of 24 and printed on premium-grade paper with a photo-like shine that's made in the USA. Each one comes with a special message on the front and cute "nutrition facts" on the back. Your guest won't be able to stop themselves from smiling! They are designed specifically for Hershey's® 1.55-ounce candy bars, and include the foil wrapper too. Our candy bar wrappers are easy to make, impressive to give and delicious to eat! 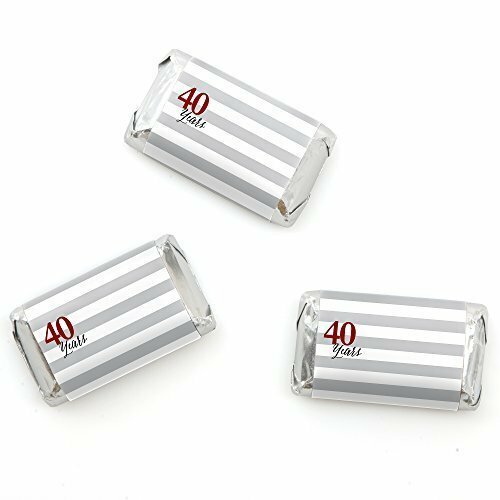 One of the easiest (and tastiest) do-it-yourself party favors available, our original We Still Do 40th Wedding Anniversary party themed mini candy bar wrapper sticker labels are a must-have for any party. Simply add these mini candy bar wrappers to Hershey's® miniature candy bars and easily create a personalized party favor beautiful enough to be scattered in the middle of your tables or placed in a bowl at the cake table as an extra treat. Your guests will love the adorable design. Mini candy bar wrappers are printed 20 per sheet so be sure to order enough for everyone because this is one party favor no one can resist. Our We Still Do 10th Wedding Anniversary party candy bar wrappers are an excellent choice for a great anniversary party favor - who doesn't love chocolate?! These wrappers are sold in sets of 24 and printed on premium-grade paper with a photo-like shine that's made in the USA. Each one comes with a special message on the front and cute "nutrition facts" on the back. Your guest won't be able to stop themselves from smiling! They are designed specifically for Hershey's® 1.55-ounce candy bars, and include the foil wrapper too. Our candy bar wrappers are easy to make, impressive to give and delicious to eat! 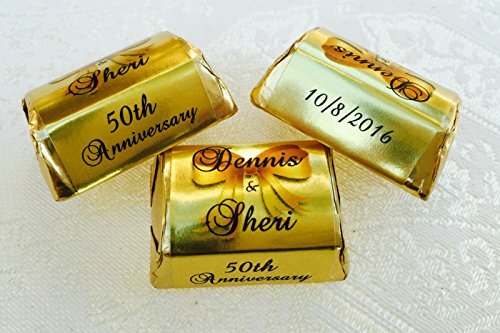 Looking for more Anniversary Candy Wrapper similar ideas? Try to explore these searches: Gold Star Clock, Cotton Maternity Dresses, and Super Stress Formula.